Are you planning a party or celebration of some kind but the venue you have booked is pretty basic and boring? You might be thinking of adding balloons and party banners to liven up the place, but we have a better idea. Have you thought of hiring LED furniture for your venue? If using brightly coloured and vibrant tables and chairs fills you with dread, we’d like the chance to change your mind. LED furniture is programmable. This means you can set it to stay on one colour or to cycle through a spectrum of different shades. You can also change the brightness so you can have it fading to a dimmer intensity and brightening up again. LED furniture can be used indoors and outside as it is fully waterproof. LED furniture is battery operated and will last between 6 to 12 hours. 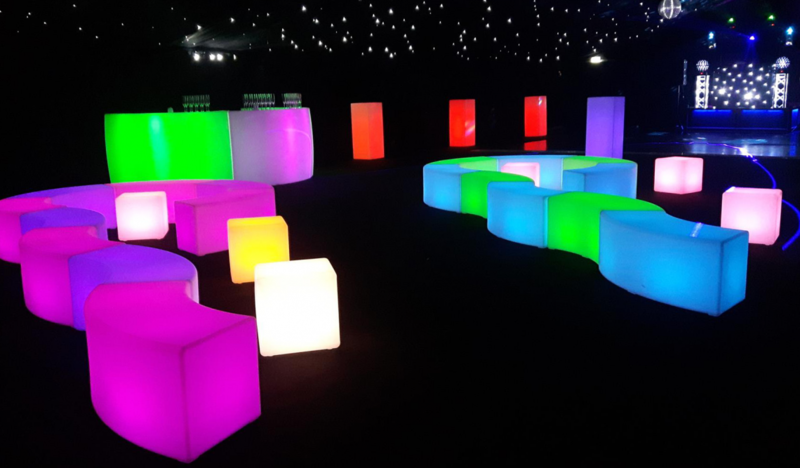 Now that you know what LED furniture is capable of, we’d like to give you a few suggestions as to how to liven up a boring venue. We have many different types of LED furniture, from tables, chairs, sofas, bars, lamps, pedestals and ornamentals. You can use as many or as little pieces as you like. Why not create an intimate seating area using our LED sofas and tables? You can brighten up any dark and gloomy areas in your venue simply by placing a few chairs or pedestals in these spaces. Use our cubes to create an outside seating area or our tall pedestals at the edges of a dance floor for people to put their drinks down. Or how about making one of our LED bars the focal point of your venue and creating a ‘go to’ area? People love to have an excuse to congregate around and have a chat and our bars serve two functions; to make you money and to gather your guests. Our columns can be used for a variety of reasons, a good way of utilising them is for lighting the way to the venue if the area outside is dark. Or why not line them around the entrance to the venue to create a more visible way in? Our LED lamps are perfect if you do not want to overdo the LED effect, as they can be placed on tables and used to lighten up the whole venue. Similarly, our LED table water drops and table pyramids are ideal for dotting around the venue and adding interest and the wow factor when your guests walk in. LED furniture can be mixed and matched with traditional and modern pieces of furniture to create whatever sort of party vibe you want. For a modern take on a traditional tea party for instance, combine our LED tea tables with wooden chairs. For a thoroughly modern wedding reception use our LED high backed chairs alongside our straight benches. LED furniture adds light and colour like no other accessory can ever do. Not only that but the pieces we offer are practical and functional as well. This means you are not giving up any space in your venue, what you are doing is adding a brilliant piece of interest that your guests can use as well as marvel at. Just imagine what LED furniture can do to your boring venue now! Time to let your imagination run wild!